London, UK, 6th March 2012 – Swyx, a market-leading vendor of Unified Communications (UC) for SMEs is to extend its product portfolio in the future with its own UC devices. The SwyxIt! P280 Handset represents the first time that the company has designed and manufactured a telephone itself. The handset is optimised to work with its software-based UC-solution SwyxWare and represents the first in a series of further Swyx hardware devices. The SwyxIt! 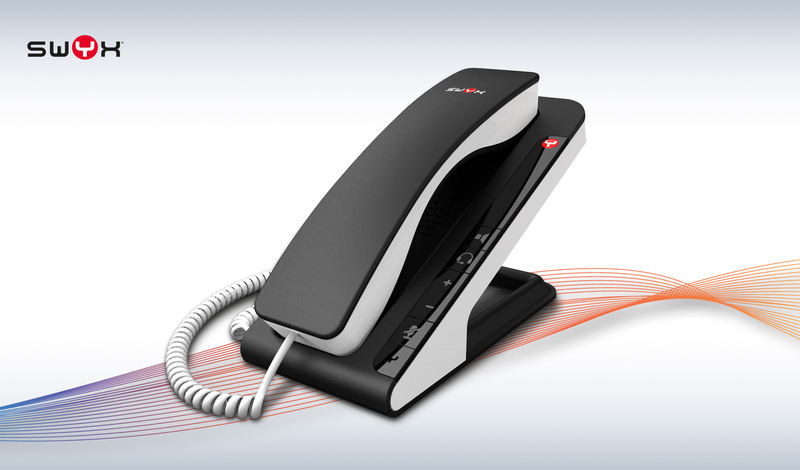 P280 Handset will be available in the second quarter of 2012. As a flexible extension of the desktop, the SwyxIt! P280 Handset offers voice quality with HD audio, support for all plugin functions together with SwyxWare 2011 R2, as well as the possibility of additional headset support with Windows XP/Vista/Windows 7. Other benefits of the hand-set include hook functionality and features like open listening and hands-free mode. The integrated loudspeakers also allow individual call signalling. The P280 is powered via the USB. “From our sales partners, we have seen an increasing demand for phones with more sophisticated designs, in line with rising customers’ expectations. We wanted to offer a modern telephone with a contemporary look and feel, which combined with rich functionality and was optimised perfectly with our communication software. The P280 represents the ideal telephone to take full advantage of Unified Communications”, explains Dr. Wolfgang Schröder, CEO at Swyx, regarding the decision to develop and produce its own devices. The P280 represents the forerunner in a series of planned devices: “We are planning the development and production of further devices, giving greater variety to our portfolio in the future. For example there will be a model that will facilitate the integration of mobile phones”, says Ralf Ebbinghaus, Executive Vice President of Sales, Marketing and Service at Swyx. For more information visit - www.swyx.com. Always ready to challenge the market, Swyx develops software based unified communication solutions that continually push the boundaries whilst maintaining its core belief that technology must always deliver tangible business value and productivity for clients. Renowned for product innovation, Swyx aims to continually delight its customers and business partners by providing the best possible products and services to help make them more competitive in their markets. Headquartered in Dortmund, Germany, Swyx has offices across Europe. Today the company is recognised as the market leader for unified communication in Europe and has enabled thousands of businesses to take advantage of the benefits of unified communication and associated applications. An easy-to-install, easy-to-maintain software-based system, SwyxWare is designed to drive a company forward. Based around familiar Microsoft® Windows® applications, the Swyx solution is designed to integrate perfectly with existing business software, including all financial and business process management tools. It offers all the agility of a business-class communication solution with the flexibility to match – and to grow with a company’s specific needs. Powerful business communication, that is simple, quick and easy to set up and manage, giving businesses full control, and making them more responsive to the needs of its customers, wherever they are.